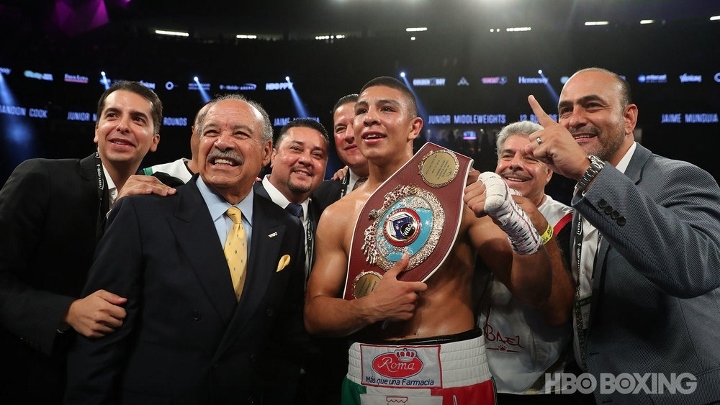 NEW YORK – Jamie Munguia has joined Golden Boy Promotions and DAZN. Promoter Oscar De La Hoya announced early Sunday morning that Mexico’s Munguia has entered a co-promotional agreement between his company and Zanfer Promotions. Zanfer has worked with the 22-year-old Munguia throughout his five-year pro career. Munguia will make his Golden Boy/DAZN debut January 26 at Toyota Center in Houston. He’ll headline a card that night against Japan’s Takeshi Inoue, who’ll challenge Munguia for his WBO junior middleweight title. The 29-year-old Inoue (13-0-1, 7 KOs), while unbeaten, is untested against top opposition. For Munguia (31-0, 26 KOs), this Golden Boy/DAZN deal helps keep him in position to land a shot at Alvarez (51-1-2, 35 KOs), who knocked out England’s Fielding (27-2, 15 KOs) in the third round Saturday night. The Tijuana native would have to move up from 154 pounds to 160 to secure that high-profile opportunity, but he is more than willing to do that. Munguia emerged as a potential star when he overwhelmed Sadam Ali in their WBO 154-pound championship match May 12. A late replacement for an ill Liam Smith, the hard-hitting, rugged Munguia knocked down Brooklyn’s Ali four times on his way to a fourth-round technical knockout victory at Turning Stone Resort & Casino in Verona, New York. Munguia has since defended his title against England’s Smith (26-2-1, 14 KOs), a former WBO champion who then was the mandatory challenger for Munguia’s championship. Munguia dropped Smith in the sixth round and beat him by unanimous decision in their 12-rounder July 21 at Hard Rock Hotel & Casino in Las Vegas. A motivated Munguia returned less than two months later to demolish Brandon Cook on the Alvarez-Gennady Golovkin undercard. Munguia stopped Canada’s Cook (20-2, 13 KOs) in the third round September 15 at T-Mobile Arena in Las Vegas. By Keith Idec, senior writer/columnist for BoxingScene.com. He can be reached on Twitter @Idecboxing.